Ask fellow campers about "Fort Bridger RV Camp" and nearby attractions. Huge p-t sites with grass! perfectly level. Several miles off I-80 so night was absolutely QUIET. Manager was very nice and friendly. I didn't use shower/bathroom but looked in them and they were spotless! I recommend this park and I will return. 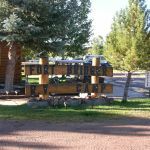 We camped at Fort Bridger RV Camp in a Travel Trailer. Great park for a one night stay. I would give it about a 7.8. If you do stay two nights, plan on visiting the Fort Bridger Fort and museum. It is within walking distance of the RV park. The sites were extremely long, and there was lots of grass between sites. If it is really windy the dust kicks up from the gravel roads, but the sites are mostly grass. See pics. 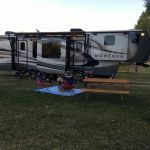 We camped at Fort Bridger RV Camp in a Fifth Wheel. Quiet campground but somewhat hard to find. Easy to miss their covered wagon sign if you come in from west. Hard right turn onto unmarked "Main St" which is gravel. Once you find the street it's easy from there. Family run by a very helpful and nice family. Large grassy sites like in olden times! Most are back-in but you can pull thru to get access for big rigs. Good hookups. Very clean rest rooms. E trembly quiet as it is a few miles from I-80. Lots of grass with some dirt spots from tire tracks that could get muddy in heavy rain. They were relatively empty but were scheduled to completely fill for weekend and the Rendevous at Ft Bridger. Very dog friendly hosts, grounds (no off leash area however, but plenty of room to walk). Would definitely stay here again. Hosts have owned for three years and are cleaning up and fixing and it shows! Very welcoming CG. We camped at Fort Bridger RV Camp in a Motorhome. Sites are fairly level with the utilities spaced to far apart. The host parked me across from my sewer compartment which in turn made the electric connection over 30' away. Overpriced for what the park offered. We camped at Fort Bridger RV Camp in a Motorhome. The park is next door to Ft. Bridger and about two miles from I-80. Rate is Good Sam. I thought it had gone up from last year. Quiet, long sites, can pull thru if not full. Host is a great guy! Cable TV did not work well for us. We like it because it is off the highway and quiet. We stay here overnight each year. We camped at Fort Bridger RV Camp in a Motorhome. Rate reflects a GS and cash discount for a week. Very nice park just 1 block from the Fort Bridger Historical Site. Electric is steady, boxes look old but work very well. Water pressure was 60PSI but it drops a little when park is busy in the evenings. Sites are generous in spacing, level, dirt and gravel with grass patio area, lots of trees but open sites too. Sites have a nice picnic table. Staff is friendly and keep the park watered and clean. Park host is very nice, very knowledgeable about the local area and can recommend sights to see and places to eat. The washer room was clean, has 2 washers but only one dryer working when we were there. $1.50/2.00. Load did dry within the $2 cycle. Shower/restrooms are individual, we did not use, but they looked clean on quick glance. Verizon is a little weak here, mostly 3G with 2 bars but the parks wifi is very good, fast and consistent. Sites are very long, back to back, mostly they will put you in a pull-though, but there are a few back up. There are monthlies here, but they are along the fence line, all back-ins, they were all very neat and clean. Speed limit was observed in the park. We would have liked to see a dog leash rule enforced. We would visit here again. We camped at Fort Bridger RV Camp in a Travel Trailer. Visit the Fort Bridger Historical site, Fossil Butte National Monument is only about 50 miles north, through gorgeous countryside. The grocery store in Mountain View, about 5 miles from the park is very nice. 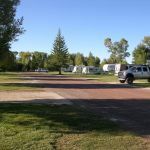 A no frills RV park that is good for an overnighter. Close to interstate but far enough away that it is quiet. Long pull thru grass level sites . Cable and Wi-Fi is available. Very clean and nice bathrooms and showers. Would stay again for an overnighter. We camped at Fort Bridger RV Camp in a Motorhome. Very large sites 80 feet long so no need to unhook for an overnight stay. That's a big plus. WiFi was a good 10-15 mbps. Cable TV was marginal. Sometimes good other times weak. Very helpful office staff. No pool or other amenities. Perfect for an overnight while crossing Wyoming on I-80. We camped at Fort Bridger RV Camp in a Travel Trailer. Fort Bridger historical site is right next door. Well worth a visit. Beautiful green and tree RV park. Huge pull-thru sites 35 X 80+. No pool but absolutely gorgeous. Absolutely peaceful and quiet. Park is surrounded with green trees. This park is on our list to return to. We camped at Fort Bridger RV Camp in a Motorhome. Best overnight RV park in Wyoming. Peaceful and quietness in specialized here. Good Sam discount for one night. Park WiFi was down so we had to pay cash. Park charges more for credit card payment. Site was a very long, grass, pull-thru, FHU, 50 amp site. The 50 amp kept tripping our Surge Guard so we connected to 30 amp with no further problems. We had good DishTV satellite reception. Verizon cell and internet worked, but signal was weak. The park was okay for an overnight stay, but overpriced. We camped at Fort Bridger RV Camp in a Motorhome. Ft. Bridger RV Park is a quaint, old style RV Park. It's nothing fancy but it is clean, level and spacious. Sites are gravel and surrounded by lawn throughout the park. Ft. Bridger is good for an overnight or an extended stay while visiting Flaming Gorge. 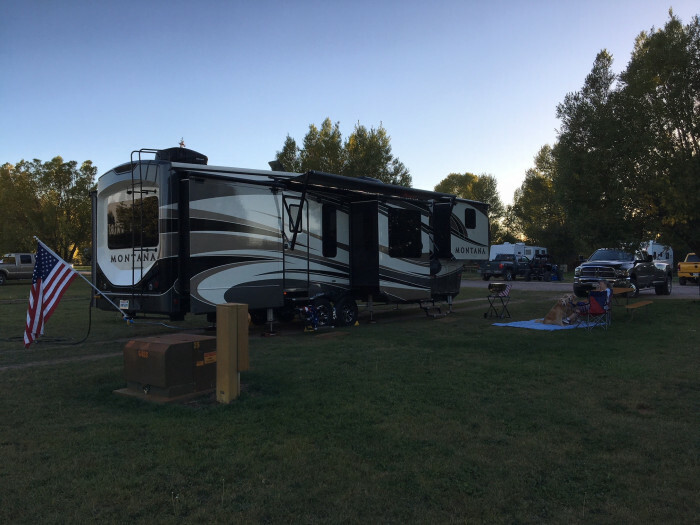 We camped at Fort Bridger RV Camp in a Fifth Wheel. The campground is located well away from the freeway, so there is no road noise. The sites are in a open grassy area. Sites were very level. The road is dirt, so there were a lot of puddles this time of year. There were a few long termers. We were the only short termers there so the wifi worked great. Bathrooms, shower rooms and laundry were very clean and tidy. Staff was very friendly. Cell service worked well. 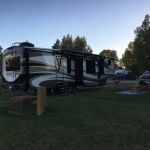 We camped at Fort Bridger RV Camp in a Travel Trailer. Entrance to the RV park is right next to the entrance to historical Fort Bridger. Look for the covered wagon. Friendly staff. Good cable. Forgot to check Verizon wireless and MIFI signals. Four individual restrooms with private large showers. Laundry facilities on site. Wide open grassy site. Only downside was that we arrived after a rain and the road was mucky to say the least. We camped at Fort Bridger RV Camp in a Motorhome. Historical Fort Bridger and museum is a two block walk from the RV camp. Well worth the visit. I was unaware that the road through the town of Fort Bridger was on the old Lincoln Highway. Good information about this too at the museum. Friendly staff, grass spots, poor wifi, poor phone signal (att), several perminant residents but all well kept vehicles and friendly. Entry is tricky and easy to miss turn. We had to drive several miles to turn around. Quiet area for an over nighter. We camped at Fort Bridger RV Camp in a Motorhome. After a day of truck troubles and issues we were happy to make to this park for the night. It wasn't too far off the interstate and was nice and quiet. The host was very helpful and they were most apologetic about giving us a back in site with out 40ft. 5th wheel instead of a pull through but we assured them, it was perfectly fine. They helped up back in and get settled. This campground has lots of grass and reminded me of other places I'd stayed that were old mobile home parks that have been converted for rv's. We had good space between the campers and the services all worked well. It worked really well for a stop over after a long day. Everyone was very friendly regardless of if they were long term residents or other rv'ers. The park was very neat and tidy. 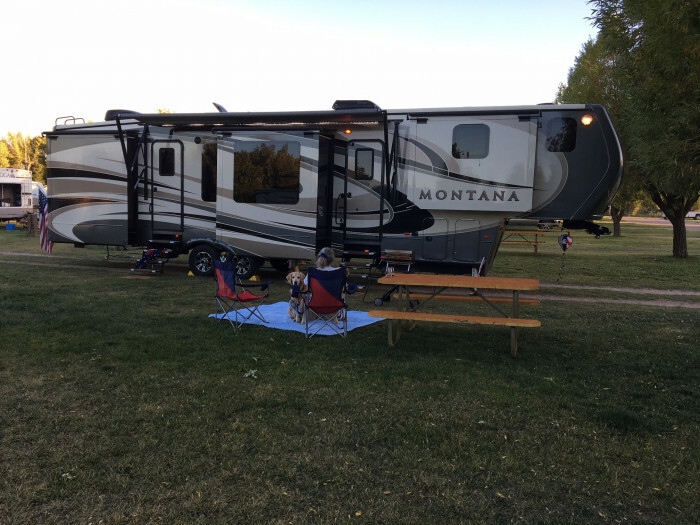 We camped at Fort Bridger RV Camp in a Fifth Wheel. Fiesta Guadalajara is a mexican restaurant about 4 miles away - excellent food and lots of it! Cable hookups were available but a little unorthodox setup as several sites came off one localized hook up. We didn't try the hookup as we were only there overnight. Fort Bridger State Historic Park, you must take at least two hours if you realy want to read everything. Great displays and a great replica of Jim Bridgers house, A MUST SEE. There is grocery shopping about 15 minutes away. Don't expect to eat out at fine cuisine in the area without a drive, so stock up at the grocery store. For pet lovers there is a VERY good vet right down the road, which was a pleasant surprise. The campground itself isn't much to look at, but it is right along side Ft. Bridger historic park, which is well worth a visit. We went after hours and found that we could deposit our fee at the gate and we wandered the park pretty much by ourselves. Fort Bridger is a short walk back up the road you come in and is a great way to stretch your legs a bit after a long drive. Evanston Wyo. for the Cowboys Days Rodeo / Shopping at Mountain Home Wyo. for food / and just driving around looking for treasures. Fort Bridger State Park was next door to the park. The town of Mountain View is a short drive and has a pretty good grocery store. Hard to find as noted by others, turn between the Fort (designated by the statue of Jim Bridger if you don't see the sign) and the old Trading Post. Don't worry about the dirt road...it leads to the log cabin office. Cash only - There were no street signs in town when we were here. Turn right immediately after the driveway entrance to Fort Bridger Museum. Follow it all the way down to where the street turns to the right. The park is on the left right at the turn. All side roads in town are dirt. There is diesel at the town gas station. Ft. Bridger Museum (adjacent). There is also remnant (replica?) of early 20th century travel cabins. Close to Ft. Bridger Historical Park but we did not see the Fort due to snow storm. Are you affiliated with Fort Bridger RV Camp ?